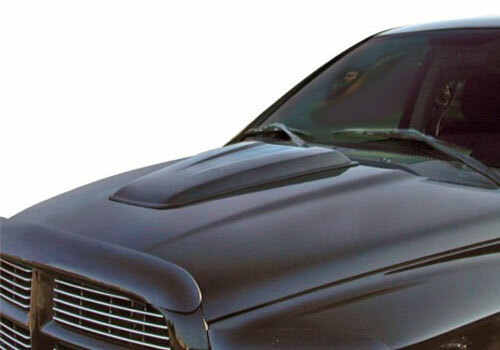 Lund Single Cowl Induction Hood Scoop Lund Single Cowl Induction Hood Scoop, Lund 80005 Large Hood Scoop, Large ABS Hood Scoop, Large Hood Scoop, Hood Scoop, ABS Hood Scoop, Custom Hood Scoop, Dodge Ram Hood Scoop, Dodge Dakota Hood Scoop, Dodge Durango Hood Scoop, Dodge Nitro Hood Scoop, [Lund 80005 Cowl Hood Scoop] - $99.95 : 3rd Strike Performance, Your Source for Late Model MOPAR Performance Parts and Accessories! If you own a Mopar, chances are you probably have a Hemi under the hood. Let's be honest, the factory hood look may not do all that horsepower justice. This quality cosmetic Cowl Induction Hood Scoop by Lund International can let you add that sporty look without having to replace the hood itself. Not only will it save you some money, but it's rugged ABS construction is easily painted to match your factory color too! Installation is so easy- just utilize the pre-applied automotive grade adhesive. Transforms Stock Hood Into a Simulated “Performance Hood”. Give your vehicle a muscular, high-performance look. Tough ABS molded plastic can be painted to match or complement vehicle's color. Smooth styling lines offer a unique accent to the curved hood profile. Easy to install with 3M self-adhesive tape (included). No drilling and no tools required.